BRIGHTON, Mich.- If you're driving a Ford vehicle with Ford SYNC, you already know how convenient it is to pair your smartphone with the infotainment system to enhance your driving experience. Well that experience it about to get even better since you will soon be able to Stream Music with Spotify and Ford SYNC AppLink! Spotify, the top on-demand music streaming service that provides access to over 20 million songs, is now compatible with Ford SYNC AppLink. Spotify has more than 20 million active users globally, and 5 million of those users are paying subscribers for premium memberships. With more than one million Ford vehicles in North America today equipped with Ford SYNC AppLink, Ford's partnership with Spotify will bring hands-free, voice-activated entertainment while driving. A terrific addition to the infotainment system's features, Ford drivers will be able to access more than 20 million tracks, and playlists while keeping their hands on the steering wheel and eyes on the road. Spotify Premium subscribers will be able to access the following features from their Ford vehicle when the app is running on their SYNC-connected iPhone, all with simple voice commands: Now Playing, Star/Unstar Track, Add Track to your "Road Trip" Playlist, Choose Playlist, Play Starred, Play Music, Similar Music, Recently Played, Start Album/Artist/Track Radio, Shuffle On/Off, Repeat On/Off, Skip Track Forward/Back, Play/Pause, Built In Social Sharing Capabilities, and Program the preset number keys so they work like a radio and save the currently playing album, artist or playlist to that number for easy access. 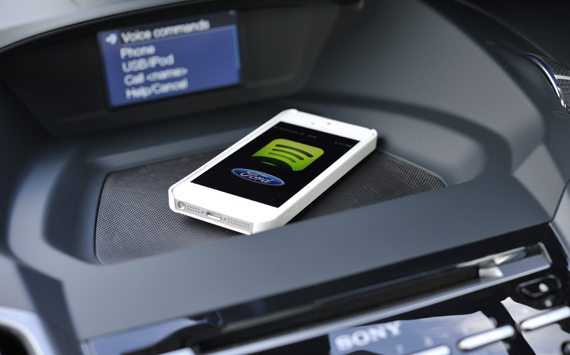 Spotify's integration with Ford SYNC AppLink is the music streaming service's first collaboration with and automotive manufacturer. As the number of vehicles on the road equipped with AppLink continues to increase, more and more drivers will soon be able to Stream Music with Spotify and Ford SYNC AppLink! If you need assistance with your vehicle's Ford SYNC system, give us a call, we'd be happy to help! Brighton Ford is located at 8240 Grand River Ave. just north of I-96 in Brighton. We are a family owned and operated business that strives on customer satisfaction. For more information on Brighton Ford visit BrightonFord.com or give us a call at (800)-836-8206.